Note: Intel Corporation, the subject of the article below, is a Leadership Supporter of the Forum's current "Say on Pay" program and is represented on the Program Panel by Cary I. Klafter, the company's Corporate Secretary and Vice President of Legal and Corporate Affairs, who is quoted below. Walden Asset Management, January 28, 2009 (January 27, 2009 release date) press release: "Intel Adopts Advisory Vote on Executive Pay"
Intel Corp. has become the latest company to let shareholders vote on its executive-compensation policies, showing that more big corporations are reacting to concern about high executive pay and indications that Congress will take action. The computer-chip maker will give shareholders a nonbinding vote on its pay policies -- a "say on pay" vote -- at its annual meeting in May, said Intel Corporate Secretary Cary Klafter. In the past two weeks, both Hewlett-Packard Co. and Occidental Petroleum Corp. moved toward annual shareholder votes on compensation in 2011 and 2010, respectively. Sixteen U.S. companies now grant or plan to grant shareholders advisory votes on executive pay; none of the votes will be binding. A dozen more corporate boards are mulling whether to follow suit, said Timothy Smith, senior vice president of Walden Asset Management, which co-sponsored a shareholder resolution urging Intel to adopt say on pay. Walden and other activist investors submitted or plan to submit resolutions at about 100 companies this year, Mr. Smith said. The moves underscore how the financial crisis and last year's election are fueling efforts to police executive compensation. Congress imposed some limits on executive pay for companies that participate in the $700 billion financial-industry bailout, but critics say those are inadequate and want stricter rules that would apply to more companies. President Barack Obama and key Democratic lawmakers support requiring all public companies to offer shareholders an annual advisory vote; Mr. Obama sponsored such a bill as a senator. Legislation passed the House in 2007, but stalled in the Senate. Mary Schapiro, the new head of the Securities and Exchange Commission, also supports say on pay. "It's not binding but people will be unlikely to ignore it" because of all the negative publicity that would engender, said Rep. Barney Frank (D., Mass. ), chairman of the House Financial Services Committee and a main proponent of say-on-pay legislation. At Jackson Hewitt Tax Service Inc., nearly a third of shares voted gave a thumbs down to the company's pay policies; the board will take that "into consideration" during this year's pay deliberations, said a spokeswoman. Others express doubt about whether shareholder votes limit compensation. "I don't know that companies will necessarily be influenced by these votes except in the court of public opinion," said Mark Borges, a principal at pay consultant Compensia Inc.
Shareholders in the U.K. have cast advisory votes on pay since 2003. That year, a majority of votes cast opposed the compensation plan at drug maker GlaxoSmithKline PLC, and the company agreed to overhaul its pay practices. Pay for U.K. executives has continued to rise, but some activists think the shareholder votes have curbed excesses. Last week, Swiss activist investor group Ethos said Credit Suisse Group, Nestle SA and UBS AG agreed to give shareholders advisory votes on executive pay. Many companies, including Walt Disney Co. and Apple Inc., argue against the move. Opponents say it's hard for shareholders to parse complicated compensation schemes and difficult for companies to know what such votes mean. Just a year ago, support for the idea seemed to be fading. Shareholder resolutions urging companies to adopt say on pay won average support of about 41% of votes cast at 78 companies with such votes last year, down from around 42% that supported the idea at 52 companies in 2007. But public outrage about pay for top Wall Street executives -- several of whom walked away with tens of millions of dollars before their companies failed or required government support -- has changed the landscape. Investor pressure persuaded Occidental Petroleum, which had rejected say-on-pay shareholder proposals for two years, to agree, said spokesman Richard Kline. Intel, faced with its first say-on-pay resolution this year, decided to grant the vote for similar reasons, said Mr. Klafter, the corporate secretary. Intel also wanted the opportunity to "adopt our own language" for the shareholder vote before Congress weighs in, he said. The early adopters are giving shareholders a voice on different aspects of pay policies. RiskMetrics Group Inc., a proxy advisory firm, last year asked its own investors to vote separately on its overall compensation philosophy, 2007 awards and 2008 goals. Bingo-hall operator Littlefield Corp. last year asked shareholders to vote on whether its CEO's and directors' total compensation was "within 20% of an acceptable amount." Both companies saw a majority of votes support their pay practices. 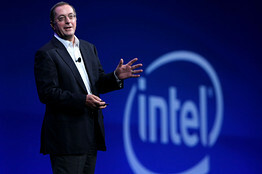 Intel will ask shareholders to vote on its executive-pay philosophy, policy and procedure, said Mr. Klafter. But the board will likely caution investors that the wording may change in future years. "Is this a useful tool? We'll see," said Mr. Klafter.